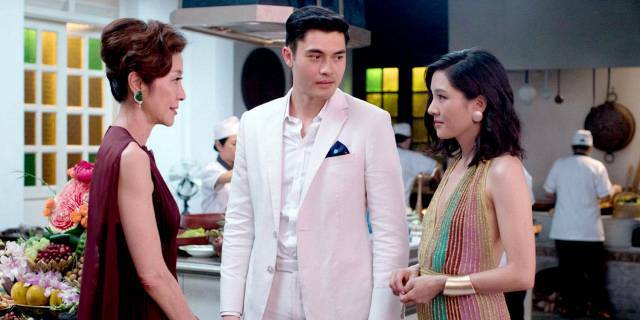 Meeting the parent: cultures clash and true love is tested in the rom-com Crazy Rich Asians. With an attractive, funny, all-Asian cast, a progressive message and an alluring premise, Crazy Rich Asians comes to us as a pre-packaged hit with a feel-good frisson and a high laugh quotient that proves the rom-com is far from dead, despite the dire warning we got last year when the well appeared to be drying out. By any fair measure, CRA is a stock standard studio romantic comedy that dutifully follows three of the basic rom-com principles: (1) the guy and girl involved must hail from different worlds; (2) huge obstacles must be placed in the way of their true love; (3) however unassailable these hurdles are, love must win out, usually with the triumphant note that custom must give way to a person’s freedom to love whomever they so choose. Thus we meet nervous protagonist Rachel (Constance Wu), an economics academic thrilled to bits that she’s on the event horizon of marriage to her super-handsome beau Nick (Henry Golding), but nervous as heck about flying to Singapore to meet his family. She learns with gleeful shock that his family is not only rich, they own a big chunk of the city. Its icily beautiful matriarch, Eleanor (Michelle Yeoh), is a stickler for tradition, so while she welcomes her son with a touch of warmth, she receives his betrothed with a death-ray stare that nearly slices her in half. Seems that Singapore’s super-rich are big on inbreeding. Poor Rachel, alone in Singapore but for one, advice-dispensing college pal Goh Peik Lin (Awkwafina, very funny here as opposed to her non-presence in Ocean’s 8) has to withstand the onslaught of the rich, spoilt friends of Nick and his family. At one point she endures an especially unpleasant, and somewhat implausible, attack during a hen’s outing. As resistance to Rachel stiffens, so too does the Nick’s resolve to follow his heart, though the weight of tradition bearing down on him carries a toll. Based on the 2013 bestseller by Kevin Kwan and directed with verve and an eye for exaggerated colours by Jon M. Chu (GI Joe: Retaliation; Step Up 2 & 3), the film is a charming, all-round winner in all the expected quarters. And with its global gross thus far standing at around $US90m, it’s more than likely to replicate that success here before going on to the planned sequels China Rich Girlfriend and Rich People Problems. To be clear, and despite what you might have heard, the film’s success is because it’s a funny, feel good, crowd-pleasing movie, not because – or just because – the film-going public includes a lot of people with Asian heritage. As with Black Panther many lofty claims are being made on behalf of Crazy Rich Asians in the name of diversity, of how the film supposedly represents some sort of major breakthrough in the representation of Asians on Western screens. But as with Black Panther and its championing of black actors on screen, the film is the latest in a long series of forward steps rather than a leap. True, Crazy Rich Asians stars a predominantly Asian cast, and good it shall be if it promotes more casting of good Asian actors who can carry a film and draw a crowd. But Crazy Rich Asians is not the ground-breaker it’s being made out to be. It’s simply the latest logical progression in the growing prominence of Asians in Western films, something that has been evolving organically and with increasing momentum for more than 60 years. And so forth. The more you look the deeper it goes. Hollywood fell in love with Bruce Lee in the 1970s. Jerry Lewis Made The Geisha Boy in 1958; Sessue Hayakawa owned much of David Lean’s 1957 classic The Bridge on the River Kwai. And in 2000 Crouching Tiger, Hidden Dragon was released on over 2000 screens across America and ended up taking more than $US312 million worldwide, and all with subtitled prints. So while the all-Asian cast in Crazy Rich Asians is fabulous, it’s certainly no shock and barely qualifies as a surprise. Only social justice warriors obsessed with the diversity issue would herald the film as some sort of landmark, as though the prominence of Asian faces in Western films was anything new or all that remarkable. It’s virtue signalling based on the false presumption that cinema from other cultures is resisted in the West, when the opposite is demonstrably true. Even the growing number of Chinese-American co-productions can be seen as the latest part in an organic cultural process that has been going on for decades. Mark Wahlberg and director Peter Berg team up again for another action film, and while Mile 22 is not in the league of Patriots Day, Deepwater Horizon or Lone Survivor (their best coupling so far), it does deliver lashings of frenetically edited fire fights and fireballs. Yelling. Smashing glass. Twirling cars. Muzzle flash. You know the drill. The very basic story involves Wahlberg and his hot-to-trot team of patriotic black ops agents having to transport a high-value prisoner through 22 miles – that’s 35.4 kilometres – of unfriendly Indonesian streets that are teeming with teams of terrorists armed with motorcycles and machine guns who are dead set on stopping them. Their rendezvous is with a military cargo plane that will touch down and only wait on the tarmac for a few minutes before heading back to the safety of US air space. Those who care might want to fault the film’s story for bearing some resemblance to the 2006 Bruce Willis film 16 Blocks, which also involved transporting a person through hostile streets. More serious nitpickers should have fun spotting the film’s story holes, especially when it comes to cutting a deal with the US government. Those quibbles aside, Mile 22 makes for a fine, undemanding action time-killer. Fans of female kickboxer Rhonda Rousey will enjoy watching her here, all armed up and ready to serve her country alongside Lauren Cohan (The Walking Dead), who loves giving bad guys what they deserve. Girls with guns. Love it. Too many recent Australian films have been so poor they’ve made this reviewer feel like we were back in the bad-old 1980s. The Flip Side, a dire attempt at a romantic comedy, is the latest one. Adelaide cafe manager Ronnie (Emily Taheny) and her boyfriend Jeff (Luke McKenzie) welcome the arrival of film star Henry (Eddie Izzard) and his French girlfriend/business manager Sophie (Vanessa Guide). Henry is on a promotional visit for his new film and Jeff, a writer, is star struck enough to invite the power couple to stay with them. This is awkward for Ronnie. You see, she had a fling with Henry while making the film, and though they thought they had broken up now find their old feelings percolating. While this is going on, Sophie also starts finding Jeff attractive. Now, nothing wrong with the premise, which breathes with comic potential. What kills this film are its flat performances, snail’s pace and almost complete lack of comic energy. Why is Luke so bland? How can a comedy starring Eddie Izzard not be funny? For decades a common complaint about bad Australian films has been the sheer lack of story development. This was particularly rife in the 1980s and 1990s. Now, the problem appears to be rising again as one sits before The Flip Side wondering how much better the film might have been had the characters been brought to life. Alas, the direction by feature first-timer Marion Pilowsky, who co-wrote the screenplay with Lee Sellars, often seems lost. Scenes will play through without any score, then a burst of pop music will suddenly burst out, usually at an inappropriate dramatic juncture. We’re nearly 20 years into the 21st century and the Australian film industry simply can’t afford to still be making movies this bad, then releasing them in the hope of attracting an ill-defined audience. In fact, it’s hard to figure out just who the market for the film is. One reason for the confusion is why a film with apparently light intentions features so much heavy swearing. Here’s wishing The Flip Side makes $10 million. In the slightly more likely event that it bombs, however, it’ll just be another clueless dud to rack up in what has been a pretty ordinary year for Australian cinema.